In the first 3d tutorial we show how to create a very simple 3d scene surrounded by a skybox and how to move the camera in the scene. To keep the example easy, we create a simple scene with merely a cube on a plane. Additionally we enclose the scene with a skybox. A skybox is a popular technique to create a background for a 3d scene. The whole scene is wrapped inside a textured cuboid. Each plane of the cuboid is textured with a different image (cube mapping). Beside the sky, the skybox textures may also contain distant mountains or buildings, thus making the scene look bigger and more impressive. We will use the cube mapping technique not only for the skybox but also for the cube. The node Graph::CubemapTexture can be used to create a texture object which contains all six texture images for the cuboid. Firstly we specify the individual image resources in the file package.xml. 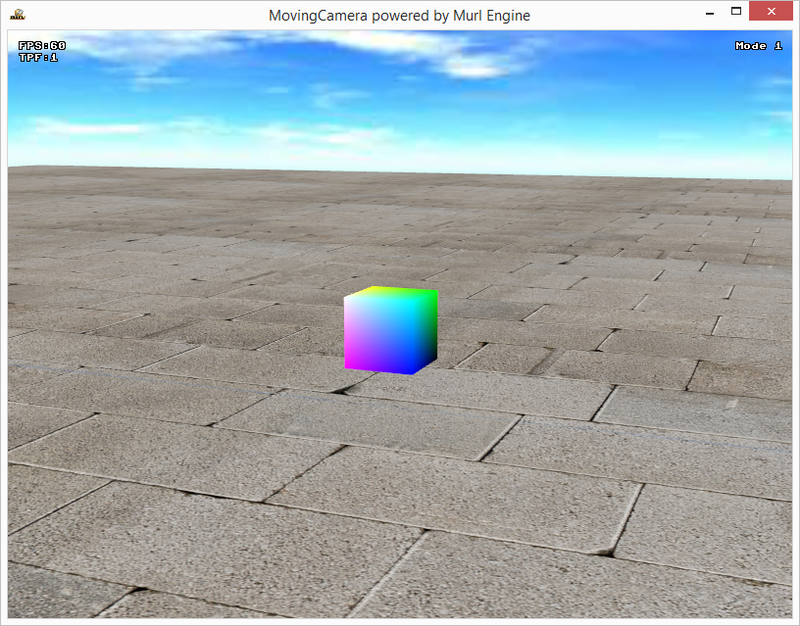 Next we create a CubemapTexture object and define a suitable textureSlot with a TextureState node. Changing the attribute wrapModeX and wrapModeY from default value REPEAT to CLAMP_TO_EDGE prevents unaesthetic artifacts on the edges. As there is no FixedProgram which can be used to draw cube maps, we need a ShaderProgram. The new file needs to be listed as a resource in the package.xml file before it can be used. Next, we define a Shader node and a ShaderProgram node in the materials.xml file. The ShaderProgram can then be used to create the Material nodes. Now we are able to define the nodes for the skybox, the cube and the plane. We define the position of the camera (as for every other object) by a number of transformations. The primary position is defined by the CameraTransform node. Additional transform operations can be defined by nesting the CameraTransform node within additional Transform nodes. In computer graphics a transformation is usually done by multiplying the vertex data with a four-dimensional transformation matrix (see also https://en.wikipedia.org/wiki/Transformation_matrix). Each Transform node contains such a 4x4 transformation matrix. The execution order for nested Transform nodes is from inner to outer. So the transformation of the most inner Transform node is applied first. There are, of course, various possibilities for the implementation of the camera movement. Three different methods are outlined below. In the header file we define a reference to the CameraTransform node, two member variables to store the rotation and the position vector and an additional member variable to store the current mode. To reset the positon of the camera, we create an identity matrix and adjust the translation values to the initial camera position (0/0/512). The method SetTransform() is then used to overwrite the values of the transformation matrix of the CameraTransform node. This method directly sets the rotation and translation parameter of the transformation matrix. The rotation values are set as Euler angles (see also en.wikipedia.org/wiki/Euler_angles). At first we calculate a direction vector depending on the currently pressed keys. This direction vector will also be used by the other methods. The member variable mPos and mRot are used to store the current translation and rotation vector, respectively. We use the method GetTransform() to get the transformation matrix and use the methods SetRotationComponent and SetTranslationComponent to update the rotation values and translation values, respectively. The camera moves always along the x/y/z axis of the world and not along the viewing direction. Due to the rotation order z, y, x, it is not possible to control the rotation independently e.g. if your viewing direction is along the x axis, it is not possible to roll. Changing the values for x and z would have the same affect (see also en.wikipedia.org/wiki/Gimbal_lock). The best way to understand the limitations is to try it out and experiment. Hint! It is also possible to set the rotation by using the method SetRotationComponentAxisAngle or by using quaternions. This method solves the previous problems. We don't store and set the rotation and translation components of the matrix but instead directly apply every change by a matrix multiplication. The camera moves always along the viewing direction and you can control the roll, pitch and yaw angle independently. You can fly around. The third method demonstrates a FPS style mode. For this mode we allow to control the rotation with the mouse but move always on the plane. The camera moves always along the viewing direction but the y position stays always the same (or would typically be defined by the terrain). You can walk around and look up and down.